Tetris DS is a puzzle title for the Nintendo DS featuring familiar Tetris gameplay with a Nintendo theme and several new modes. Since the first Tetris handheld title was released on the original Game Boy, the series has been a great system-seller, sometimes even releasing multiple titles per system under the guidance of Nintendo and other publishers. Tetris DS was developed internally by Nintendo. However, to set it apart from the previous games in the series, the game capitalized on Nintendo's famous retro games and characters, which include the Mario franchise, as the backdrops and inspiration for the Tetris action. The game is also part of Nintendo’s Touch! Generations series of games, "intended for a variety of demographics". Each mode recalls a particular game in Nintendo's history. Backgrounds have been updated. The uniting theme behind any Tetris title is to arrange Tetriminos, shapes made of four colored blocks, into horizontal lines in a 10 block wide well. When a row of the well is filled with blocks, regardless of color, the row will disappear and a player’s score will increase. Bonus points are awarded for clearing more than one row at once. Clearing four lines is called a "Tetris," and is worth the most points. However, as soon as one mass of blocks is laid, another begins to fall. If the blocks ever overflow out of the arena, the player fails. Unlike most other puzzlers, such as Puzzle League, the blocks do not always come in the same arrangement. Instead, there are seven different block patterns. They may be rotated as a group, even when first landing on other blocks or the floor, but their form will not change. Also, players may speed up the game by warping blocks to the floor in certain modes instead of waiting for them to fall. Markers at the floor show where they will land. It is also possible to "hold" a Tetrimino until it is needed later. 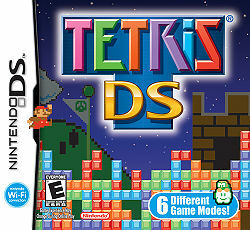 Tetris DS sets itself apart through its wide variety of modes. Each mode keeps the same basic rules intact, but is very liberal with them. Also, up to ten people can play against each other at once with local multiplayer. The main draw of the game is the utilization of the Nintendo Wi-Fi Connection, which allows for multiplayer games for two to four players. This title is truly a compilation of six game play modes. Each of the modes is themed after a particular famous Nintendo title and utilizes its own goals and rules. However, all revolve around the original Tetriminos concept. In multiplayer mode, the top screen shows opponents' play fields. Standard mode is a version of the basic Tetris game; it has no new twists or new rules in single-player mode compared to other games based on the Tetris Guideline. However, it does keep the ability to rotate blocks after they have landed, which was introduced in Tetris Worlds. This concept is relatively new to the series, but it was altered for this version, and a time limit in multiplayer mode adds back some of the challenge that it took away when the infinite spin concept was first introduced. Each time ten lines are cleared, the theme of the level changes and difficulty increases. Slightly modernized game footage from one of Nintendo's classic games encased in what appears to be a television can always be seen on the top screen while a sprite from the same game sits to the right of the play field on the touch screen. The background songs are remixes of classic songs from the featured game. However, the meters and play field are never altered. In multiplayer mode, the top screen is dedicated to the opponents’ play fields. In multiplayer mode, clearing multiple lines will dump more blocks onto the player with the target mark on their play field on the top screen. An additional offensive element comes in the form of items. The game gives players the choice to play traditional Tetris or to play with items inspired by Super Mario Bros. and the Mario Kart series. Items appear only in multiplayer mode and are earned by clearing special ? Blocks that appear within a Tetrimino. Mushroom: While traditionally a beneficial item, when used on an opponent in this game it speeds up the descent of the Tetriminos. Boo: The player's opponents will not be able to see the upcoming blocks, destroying their foresight. Banana: This item flips the playing field horizontally. While at first this appears relatively useless, the formations of blocks coming from the ceiling do not change, meaning that it is most effective against people who have played the classic game before. Lightning: The affected players cannot rotate their Tetriminos for a set period of time. Red Shell: Usually an offensive item, in this game the Red Shell is defensive. Two rows will be cleared from the user's play field. Super Star: The user becomes invincible to his or her opponents' attacks. Additionally, the user receives only the straight I Tetriminos. 1 0-9 Super Mario Bros.
2 10-19 Super Mario Bros.
3 20-29 Super Mario Bros.
7 60-69 Super Mario Bros.
8 70-79 Super Mario Bros.
9 80-89 Super Mario Bros.
10 90-99 Super Mario Bros.
Push mode can be compared to a tug-of-war. However, players push instead of pull. Push Mode was designed for players who wanted a more competitive way to play than just comparing scores. Players are virtually seated across from each other, with a pile of blocks in the center. The Tetriminos are like missiles in this mode and can be sent by the player just as quickly as he or she can play the game. If one clears a row, the mass moves toward his or her opponent, decreasing the opponent’s play area and increasing the player's. When one player has pushed the pile out of the screen towards their opponent, he or she wins. The mode is decorated by a Donkey Kong inspired environment. Pauline and Donkey Kong can be seen at the very top of the screen when it scrolls, and Mario walks around the girders on the top screen, dodging barrels and using the ladders. Mario's Hammer and Pauline's Parasol are located to the left of the playing field. Also, as ones play field grows smaller, fire erupts from the Oil Drum at the bottom of the screen. In the original game, barrels burned up when they hit this fire. The classic Donkey Kong beeps play in the background. It speeds up as the blocks near one of the edges. Only Tetriminos on the touch screen can be moved in Touch Mode. 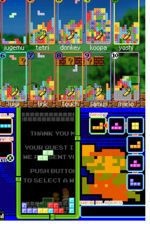 Part of Nintendo's effort to use the Nintendo DS' touch screen in all possible games, this mode allows players to use their stylus to shift and rotate a pre-set arrangement of the blocks. While most other modes feature falling blocks, this mode has them already in place. By arranging them in horizontal lines, they will disappear. The game ends when no more combinations can be made. Players strive to clear the most points possible. Balloon Fight provides the backdrop for this mode. Balloon Fighter and the enemies can be seen flapping their way through the sky on their balloons. There are also gray pipes which release light blue balloons. Starry skies and buried fossils make the background. The unaltered main theme plays in the background. However, there are occasionally fanfare blasts based on one’s progress. Puzzle mode is one of many single-player options. Puzzle mode presents players with the challenge of clearing all of the blocks already on their screen using only the blocks in their inventory. To succeed players need to think ahead and know how the puzzle will change based on each possible outcome. The Tetriminos can be rotated in any direction before being dropped, but once a location is selected, players cannot manipulate them. However, there is no time limit, so players may think for as long as they need. This mode takes place in Mario's bakery from Yoshi's Cookie. However, instead of Yoshi Cookies in the oven, there are Tetriminos. Mario sits to the right operating the machine while Baby Yoshis hold a sign showing the puzzle's level number. The touch screen's background is decorated with the promotional artwork from the game featuring Yoshi in a pile of cookies, which shows a winking Yoshi when the puzzle is cleared. "Holding" blocks is a key strategy in this mode. Unlike Puzzle mode, where the challenge's goal remains the same throughout the game, in Mission mode it changes every time the challenge is met. For example, the game may ask a player to use a square O Tetrimino to clear two rows of blocks at once. In this case, the player should line up two horizontal rows of block each eight across, but a space matching the block should be left open. Then, when the desired block begins to fall from the top of the play field, the player should place it so that two complete rows are formed. The challenges get more complex as time passes. In multiplayer mode, players race to see who can clear each mission first. This mode takes its artistic inspiration from The Legend of Zelda. On the top screen, a waterfall resembling the opening screen of the title flows as a background to the goal. On the bottom screen, an elaborate mountainside fortress serves as the background. In the play field, one can see a series of caves. A sprite of Link, Octorok or another character from the game appears on the bottom screen based on how far the player has progressed. The sprite has been turned into a flat 3-D object that spins around. A remix of the overworld theme plays in the background. Players control the clump of blocks rather than the falling ones. While the other modes instruct players to drop and adjust blocks into the play field, Catch mode is the only mode players instead control the play field. Boundaries are removed and the field can be moved anywhere in two dimensional space or rotated. Only the descent speed of the Tetriminos can be controlled. As they fall from the top screen to the bottom, players must ram the mass into the blocks to catch them. Players can attach them to on the top, bottom or the sides. If a player allows a Tetrimino to miss, rams into one during a rotation, or makes contact with a Metroid, he or she will lose energy. The game ends when no energy remains. The mass contains one flashing block. Players attempt to establish a four by four mass of blocks that includes the flashing one. When this happens, the mass will detonate shortly after, taking all blocks and enemies directly above, below, or to its sides with it. Players also have the option of pressing the X Button to detonate immediately. A new block then begins flashing. Also, some energy is regained though this process. The mode’s visuals imply a mass moving up a large corridor from the original Metroid game. Samus' many sprites can be seen throughout the level, including a cascade of jumping sprites showing how Samus jumps from one ledge to another. Also, enemies from the game serve as hazards. The title screen features characters interacting with Tetriminos. Several other cameos that are not part of the main game play are also included in the game in the form of menus. Many of the game's featured characters appear in the top screen if players wait at the title screen. The following cameos are in order of appearance. The Legend of Zelda: Link slashes Tetriminos as if they were enemies using his sword. Donkey Kong: Donkey Kong and Mario appear on screen, where the blocks are used as barrels. Donkey Kong throws them at him, who smashes them with the hammer. Occasionally, Donkey Kong Jr. will climb down the right side of the screen, distracting the plumber for long enough to get hit. Metroid: Samus shoots blocks as if they were enemies. Balloon Fight: The Balloon Fighter flies around, dodging two Tetriminos attached to balloons. Occasionally, it pops one or both. Super Mario Bros.: Mario jumps on a block as if it were a Goomba, then uses one as a floating ? Block containing ten coins. Yoshi's Cookie: Tetriminos roll towards Yoshi, who simply eats them. Mario Bros.: Mario and Luigi chase each other until Luigi hits a floating Tetrimino that acts as a POW Block. More specifically, this refers to the Famicom start-up screen, in which Mario and Luigi chased each other around while hitting the button to change the color scheme. With few exceptions, Professor Hector from Gyromite can be seen in the top screen during the menu, as well as the stage from Mario Bros. On the touch screen, the opening for the Famicom Disk System is the background. The background music in the Records section is the Game Boy version of Tetris high score music. Also, the credits music, designed to sound like it came from an 8-bit game, ends with the Super Mario Bros. overworld and Super Star themes and the Donkey Kong 25m theme. Players can view their records in this menu. However, the menu features sprites from NES games on the top screen (as well as the original Game Boy Tetris high score theme). Depending on how many Tetris Points the player has, the top screen sprite changes every time the player gains 1000 points (this does not apply after the player earns more that 10000 points). To earn points, the player must set a high score or complete anything they haven't done before in different modes of Tetris DS. 0-999 Tetris Points: Mario from Super Mario Bros..
1000-1999 Tetris Points: A Mushroom from Super Mario Bros..
2000-2999 Tetris Points: A Blooper from Super Mario Bros..
3000-3999 Tetris Points: A Balloon Fighter from Balloon Fight. 4000-4999 Tetris Points: Link from The Legend of Zelda. 5000-5999 Tetris Points: An Excitebiker from Excitebike. 6000-6999 Tetris Points: Yoshi from Yoshi's Cookie. 7000-7999 Tetris Points: Popo from Ice Climber. 8000-8999 Tetris Points: Bowser from Super Mario Bros..
9000-9999 Tetris Points: Raccoon Mario from Super Mario Bros. 3. 10000+ Tetris Points: Frog Mario from Super Mario Bros. 3. This page was last edited on February 18, 2019, at 23:07.